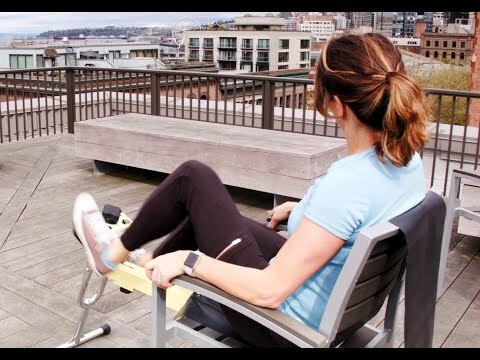 Connecting Exercise and Rehab to Everyday Life at Home, Work, and On the Go! Today, we are excited to announce the new Excy 200 Series, which like its predecessor, uses our patented approach to turn any chair into a recumbent exercise bike and works as an upper body ergometer, but we have a few new amazing additions! Available immediately, the new the Excy XCS 200 pedal exerciser now offers unicycle and step features with four adjustable heights (including a lower position as a desk cycle), 2-70 pounds of bi-directional resistance, and a new Android app to match the capabilities of the Excy iOS mobile coach! We have also integrated live streams into our apps and website at www.excy.live, where we will be integrating live streams from our customers, physical therapists, and personal trainers using the Stream.Live platform. Since launching our successful Kickstarter campaign in late 2015, we have focused on eliminating the obstacles of time and space for exercise, even with competing demands of busy to-do lists, small spaces, injury, and chronic illness. We’ve had some amazing early success in advancing people’s exercise goals since shipping our first product just over a year ago. Check out our Results page to see the impact with fitness beginners to competitive athletes, those suffering from injuries like torn ACLs, frozen shoulders, joint pain from running, and from diseases like MS, Parkinson’s, and diabetes. During this time, we’ve listened to our customers, physical therapists, and personal trainers and many wanted more resistance for heavier duty strength training, adjustable heights for even more uses cases for upper body workouts for those with limited lower extremity mobility, as well as for more workplace applications at the office desk. Adding these capabilities meant we added a little more weight, but it’s the best weight ever! At only 14 pounds and with a very small footprint, we can match or exceed the calorie expenditure and strength training offered in similar high-end equipment like BowFlex Max, Peloton Cycle, Krankcycle, Total Gym, and row machines frequently found in CrossFit gyms. Did we mention that it folds for easy storage and transport and gain, weights just 14 pounds! We also have no weight limit restrictions since most workouts use your own comfortable surface. There is a weight limit of 220 pounds for the unicycle and step positions. We are 100% committed to making a positive impact on people’s health and preventing disease through home and workplace exercise, whether rehab, post rehab, or just wanting more movement since we all know that sitting disease is killing us! According to the CDC, 80 percent of American adults fail to meet the physical activity guidelines for both aerobic and muscle-strengthening activity and the American Heart Association estimates that sedentary jobs have increased 83 percent since 1950 with physically active jobs now making up less than 20 percent of our workforce. A recent study by the University of Sydney estimates that the costs of physical inactivity around the world is $67 billion in healthcare expenditure and lost productivity, revealing the enormous economic burden of increasingly sedentary societies from the morning commute driver’s seat, to the office chair, and then the couch at home. Research has shown that resistance training and high intensity interval training (HIIT) can have significant positive implications on people’s health regardless of age and in fact, improve age-related decline in muscle. Excy’s broad resistance range, versatility, and durability is up for the HIIT and strength training job for the healthy, but also throughout the entire rehab life cycle, from getting back range of motion to building endurance and strength for performance. We think you will be impressed with Excy as a a full body exercise bike, but find an unexpected friend in using Excy as an upper body arm bike, where you can actually burn more calories than spinning with your legs. We offer a 30-day money back guarantee. Join the Excy Family! Ready when you are!